As we enter August and the first harvest of the year, I bid you Lughnasadh aka Lammas Blessings. I love the harvest season. It is such a lovely, golden time of gatherings, friendship and community, so I wanted to share with you a beautiful story that originates with the Multnomah people of the Pacific Northwestern United States. It is a story that holds a very special place in my heart, not only because it is an origin story about one of my favorite places in the world, Multnomah Falls, but because it celebrates the love and bond we have to our people and the sacrifices we make for them. Long ago, there was a Multnomah chief, who had a daughter, who was especially dear to him. When she was old enough to marry, he chose for her groom a young warrior of neighboring Clatsop people. The wedding feast was already scheduled, but before it began, a sickness came upon the village. And the people were afraid, thinking they had done something to anger the great spirit. Unsure of what to do for his people, the chief called together a group of his most trusted advisors. After much discussion, the oldest medicine man came forward and spoke of a prophesy that the Great Spirit would send a sickness to the land and that everyone would die unless a sacrifice was made of the daughter of the tribe’s leaders and that the daughter must willingly give her life for their people. And so, the disease stayed and more people died and the chief’s daughter struggled. She wondered, if she should be the one to sacrifice herself, but she couldn’t, for she loved her warrior too much to bear the thought of being separated from him. But then he too became ill and she knew what she must do. And so, she snuck off at sunset, following the river until she came to a great cliff. And as she stood at the stop, she prayed to Great Spirit and jumped. By morning all were healed and the tribe rejoiced until someone realized what this spontaneous healing meant. Once again, the daughters were called forth and one was missing. The young Clatsop warrior immediately set out to search for his love. Following the path she had taken along the river, he found her body among the rocks and buried her there. In grief, her father prayed to the Great Spirit for a token that she’s been welcome into the spirit world. Almost immediately, he heard a rush of water from above that great until the stream became beautiful waterfall that tumbled over the edge of the cliff. 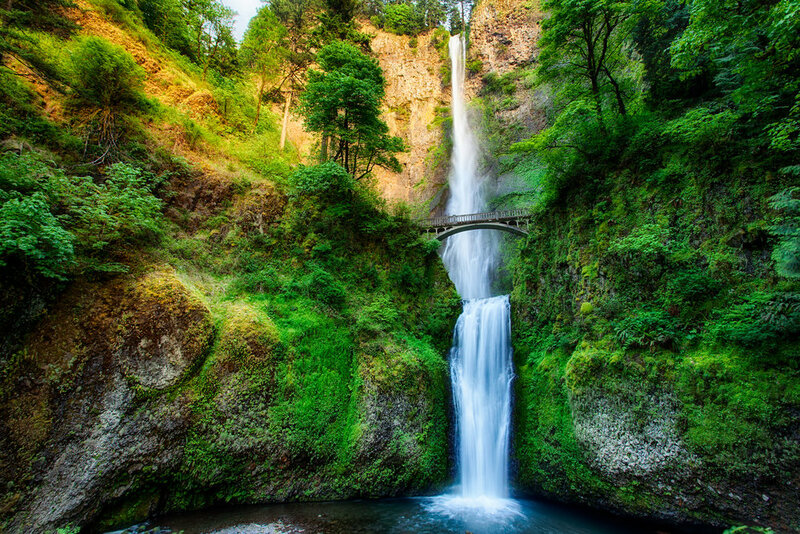 And that is how Multnomah Falls was born and the Multnomah people were saved, because of the sacrifice of the young girl who jumped in a great act of love to save her people and her beloved from disease and death. It is a lovely story isn’t it? It is one that speaks deeply to our ideas about what it means to love and to our willingness to sacrifice for it. And it’s a complex issue. Let’s face it, as women, we receive a lot of not so positive messages that sometimes seem to suggest that the quality of our love is proportionate to our willingness to sacrifice our voices, ourselves and what we want for the benefit of others and that is a very one-directional flow of energy that reflects a not always a healthy kind of love. At the same time, there is no denying that as manifestations of the Goddess, we hold within us a great capacity to nurture and love our kind and community. Indeed, one could say that all the work we do toward self-development is with the end goal of equipping ourselves to be a great force for love in our families, our communities, or world. But what IS love and how do we express it in healthy ways? The dictionary defines it as "an intense feeling of deep affection." "If there is love, there is hope that one may have real families, real brotherhood, real equanimity, real peace. " And so, this week I invite you think about love and community. What does love mean to YOU? What does community mean to you? How might you do the work of love in your own community (no sacrifices required)?